The Hippocrates juicer typically catches the attention of those who need a more compact juicer and those who want to juice wheatgrass and leafy greens without a lot of foam. Many other juicers are quite demanding of counter space and many cannot work with wheatgrass without producing tons of foam. 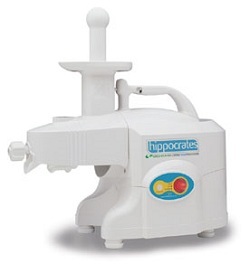 This makes the compact design of the Hippocrates machine and its unique gear design quite desirable. Yet, the most innovative products on the market aren’t always the best. Compact designs sometimes interfere with quality. You have to consider the pros and cons of the Hippocrates juicer before you make a final decision. You can take all of these pros and reduce them to two main attractions: compact design and superior juicing of wheatgrass, leafy greens, and other produce with very small veins. The compact design makes the unit more portable and easier to store. It is also very easy to clean up after you are finished juicing. When juicing wheatgrass you get less foam thanks to the uniquely designed twin gear. The gears are closer together so they are more efficient at breaking open the very small veins in leafy greens like wheatgrass. For those with limited space in the kitchen who want a machine capable of juicing up virtually any type of produce, these pros sound like a dream come true. For some it may be the ideal purchase, but consider the cons before you make your mind up completely. That may not seem like a lot of cons, but the second on this list will put the Hippocrates juicer out of the running for many consumers. This is because an imported juicer is more difficult to find in the United States and other western countries. 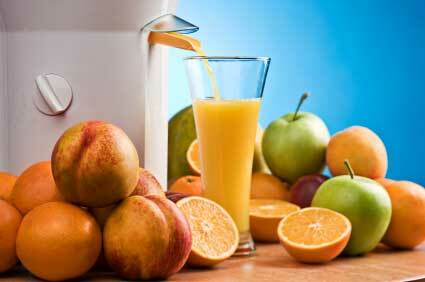 You can order these juicers online quite easily, but make sure that your order is being shipped from your own country. You should also check into the availability of parts in your country before purchasing this juicer. Parts can be much harder to find for imported machines that aren’t readily sold in stores within your own country. This means you could find that the machine isn’t easily fixed if something does go wrong over the years of use. Many consumers also find that the look of this compact machine is quite unattractive. It isn’t anything most would consider gross or disgusting, but it doesn’t have that sleek, modern look that you expect from most appliances today. It is definitely nothing to look at compared to some of the more stylish, larger juicers like those from Jack LaLanne. This is a good juicer if you need something that is easy to move around or lighter weight. If you have a small kitchen or need to store a juicer that won’t be used very often, this could be one of your leading options. Yet, those with more counter space to spare should look around before making a final decision. Click here to compare to other juicer reviews.